So if you’ve been in the market for a Tungsten Ring for any amount of time, you have probably seen Tungsten Rings that have inlays. 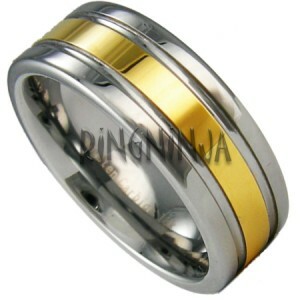 This particular Tungsten Ring has what’s known as an ‘overlay’. Basically an overlay is a fancy word for plating. Keep in mind there have been many advances in plating over the last 10 years and plating holds up better than it used to. However, even with all the advances in plating it does have some drawbacks on a Tungsten Ring, however minor these might be. One thing to really consider – if you’re in the market for a ring that is going to be scratch resistant and durable, you might want to think about looking for a ring that is solid Tungsten Wedding Ring. No overlay, inlay, etc. Reason being, if your sole purpose for purchasing one of the beautiful rings is to avoid scratching – the plating is really no stronger (well, not much anyway) than normal 18K gold. While this is a fine metal, and makes a nice ring – we all know the drawbacks of gold as jewelry. It’s soft. It’s expensive. It scratches easily – remember those old cowboy movies where they’d find gold coins, and they’d want to check to see if it was real, so they’d bite the coin to make sure it was authentic? Well, they were looking to see if they could bend it – and that’s gold for you. Soft.